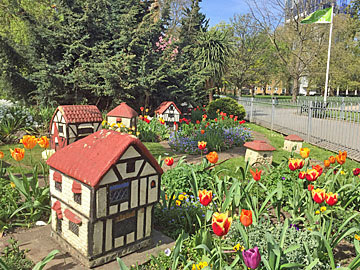 At the very start of 2017 I visited Newyears Green, London's shabbiest village. I wanted to end the year by making a similarly appropriate visit, but there is no Newyears Eve Green, nor a Hogmanay Street anywhere in the country. But London does have an Eve Road, indeed it has four, scattered around the northern half of the capital. So I've been to the complete quartet, and have unearthed some unnerving similarities between them, which hopefully you can help me explain. 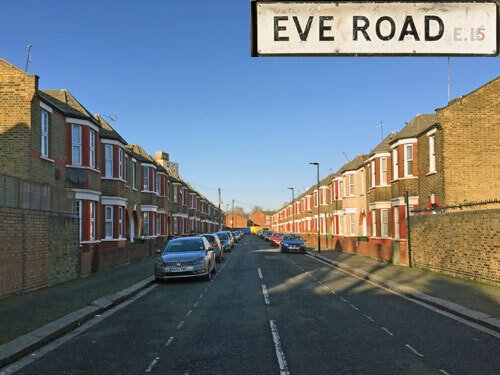 Eve Road E11 is an insignificant street of late Victorian two-storey terraced houses, barely 100 metres in length, in the lower reaches of Leytonstone. It bends off the High Road near the former Thatched House pub, between a takeaway called Caribbean Flavours and a printers I'm chuffed to see is called DG Signs. For the first few steps it belongs very much to the shops, with a row of garages for deliveries and a grubby door leading to flats above. But then it becomes somewhere built for thirty families to live - one telegraph pole, two streetlamps, six trees. All of the original houses have bay windows and arched porches, some with original plasterwork flourishes more recently highlighted in jarring pastel colours. Three houses still have an old Victorian nameplate on the front - something anonymously pastoral like Belgrave Villa - while another is now inadvisably covered in stonecladding. A handful of modern houses fill the gaps where bombs fell, these even have garages, but everyone else parks out on the street. When a deliveryman calls, his van unavoidably blocks what's left of the central carriageway. Most of Eve Road's front walls appear to have been rebuilt at a variety of times in a variety of bespoke styles, not necessarily attractively. Front gardens are small and narrow, frequently almost-filled by a cluster of Waltham Forest bins, there being no way to wheel these round the back. A tarmac stripe is still visible where some former cable company dug up the pavement. At the far end is Steele Road, whose residents sometimes nip down this way to the shops, but nobody else would ever have need to walk this way. Eve Road is a true residential backwater, but also the very backbone of the capital's housing stock. 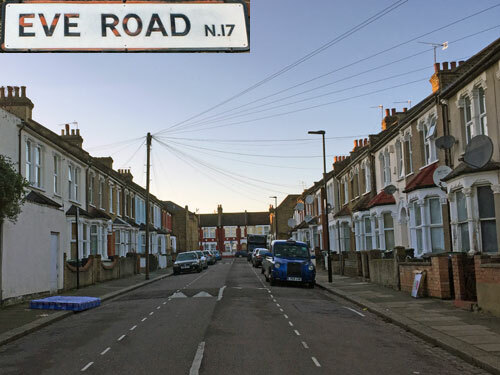 Eve Road E15 is an insignificant street of late Victorian two-storey terraced houses, approximately 200 metres in length, below the Greenway close to West Ham station. It runs almost due north, initially arrow straight - two telegraph poles, six streetlamps, no trees. Its houses are relentlessly uniform, each in London brick with redbrick trim, each with bay windows upstairs and down, each topped off with a pointy roof to give the street some character. Houses appear to be of generous width, but closer investigation reveals that each porch leads to two front doors, suggesting closely-packed council maisonettes within. Every front wall is ten bricks high, such is the street's preserved homogeneity, but some residents have attempted to brighten up their frontage with lamps, pebbledash or a swarm of artificial butterflies. Although house numbers rise beyond 100 they only start at 52, confirming that some serious rebuilding has been going on. The northern half of Eve Road no longer exists, having been demolished in the 1960s to make room for Manor Way, the chief connecting road hereabouts. At the breakpoint a low blue wall seals off direct access, as if awaiting additional redevelopment, and then the road bends sharply right past a row of somewhat bleak parking spaces. What used to be Eve Road, and isn't now Manor Way, has been covered by some typically ordinary Newham flats crammed into whatever space was left over. Here the only public space is a fenced-off lawn, upon which a small trampoline awaits better weather. Eve Road is a curious residential hybrid, but also the very backbone of the capital's housing stock. Eve Road N17 is an insignificant street of late Victorian two-storey terraced houses, barely 100 metres in length, a few streets back from Tottenham High Cross. It has only 25 houses, with rather more on one side than the other thanks to being squeezed inbetween two longer streets which merge together further south. The houses bear a striking resemblance to Eve Road in Leytonstone, with similar bay windows and plaster detail, although these porches are flat-topped rather than arched. The road's on a slight uphill slope, with the two corner houses at the top end boasting ornate doorways which suggest these might once have been shops or pubs. A speed bump marks the central point - one telegraph pole, two lampposts, no trees. Some wag has painted a white line down the centre of the road, although it'd take some careful manoeuvring to pass an oncoming vehicle now that the parked car is king. One resident owns a motor bike and is part of the gig economy, while another isn't yet, as his TX4 taxicab proclaims. Front gardens are once again tiny, and awash with bins, although certain objects too large to fit inside have been left out on the pavement. Several sheets of timber, a soggy mattress and a pink plastic toddler trolley await post-Christmas collection, or perhaps abduction by some local resident who can see a better use of their own. Eve Road is a brief humdrum backstreet, but also the very backbone of the capital's housing stock. 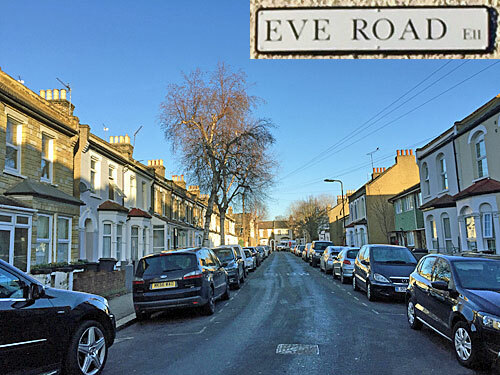 Eve Road TW7 is an insignificant street of late Victorian two-storey terraced houses, approximately 200 metres metres in length, tucked inbetween Isleworth and St Margarets. Again it forms part of a small cluster of similar streets, whose names should be becoming more familiar as we progress. This time one of these streets actually joins halfway down - four telegraph poles, five lampposts, a dozen trees. Look from one end and you might imagine we've been here before... the bay windows, the cars parked down either side, the speed bump in the centre, all seem remarkably familiar. But some sections of this terrace are flat-fronted, some of the intermediate villas are bigger, a greater proportion of houses have original rustic names, and the whole place just scrubs up a little better. In fact the houses on the eastern side hide a secret. Their gardens are much longer than those on the west and run down to the River Crane, indeed some residents even have their own small boat moored up on the bank! Number 5 has been temporarily boarded up whilst major renovation works take place, the name of the interior decorator proudly emblazoned on the hoarding. Even the Christmas wreaths are smarter, and more numerous, than those seen earlier on my travels. But there is a hidden reason why this particular Eve Road might not actually be terraced nirvana. One of the two Heathrow flightpaths passes very nearly overhead, and only by visiting during the quiet half of the day did I miss the noise pollution which must blight daily life in this otherwise endearing street. 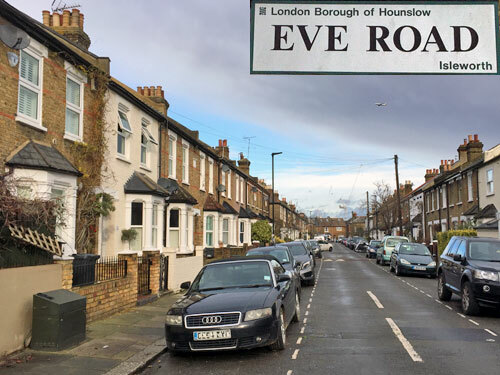 Eve Road is a contradictorily desirable address, but also the very backbone of the capital's housing stock. Which brings me to the mysterious similarity of London's Eve Roads. All four are terraced streets built at around the same time, I'd say 1880s or 1890s, and all were clearly named after the same person, place or thing. It cannot be a coincidence that every Eve Road lies close to a Napier Road and a Steele Road, that three are in the vicinity of a Ranelagh Road and that two rub up against a Belton Road, but the precise connection between Eve, Napier, Steele, Ranelagh and Belton I have not been able to determine. I did wonder whether the link was Commanders-in-Chief of the armed forces, or naval officers in the British Raj, or even places in Lincolnshire, but whatever combination of names I typed into Google failed to come up with a convincing connection. Any conclusive ideas? "The directors of the United Land Company Limited in 1883 were Lord Ranelagh, K.C.B. (Chairman), Col. E. Chaplin, E. Eve, Hon. M. Napier, Lieut.- Genl. A. F. Steele, N. W. J. Strode, and G. F. Talbot. and the company secretary was C. Belton." 1) Herbert Dip: 52 weekly-ish trips to London boroughs that never were. That was fun. For a full index, see here. 3) Pedways: I hunted down all the City's elevated concrete leftovers. 4) Boring VII: Typically the annual Boring Conference never is. 6) Walthamstow Wetlands: Numerous reservoirs, newly opened up and well worth a hike. 8) London postcodes: Which are the first and last London postcodes in alphabetical order? A surprisingly tricky question to answer. 9) Wembley Stadium: it was only to attend a shareholders meeting, but hey, I got a free lunch out of it. 10) Walking the Heathrow flightpath: So simple, so illuminating, so noisy. 6) Virginia Water: I highly recommend a long walk round the lake and a diversion into Valley Gardens. 9) Brighton: A five-clue Treasure Hunt, striding out over the Downs to Hassocks. As another year draws to a close, I thought I'd look back at what the weather's been like. Not because it's something we all want to reminisce over, but because I thought it'd be interesting to see what a full year's weather looks like. The tables below show the weather for each day in 2017, grouped into categories and totted up by month. Yes, there are still three days to go, so I've used the forecast to predict the rest, and I'll come back later to update speculation with fact. You'll see I've blanked out the background of every empty cell, to make the pattern of the coloured data stand out more, and emboldened any tally that enters double figures. This is data from a weather station in Hampstead, so won't perfectly reflect your experience, nor the national picture. But it does present an interesting picture of the year gone by, and who knew the weather wasn't really that bad? Yes, we did have a summer this year - there were six days when the maximum temperature in London topped thirty degrees, and another twenty when the temperature topped twenty-five. That doesn't sound like many, but with a hundred days making it past the 20°C mark there was plenty of short-sleeve weather to go around. 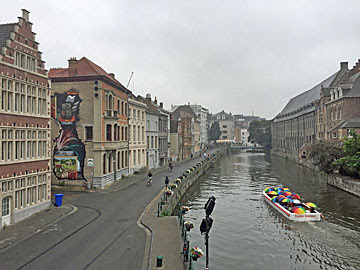 The impressive month here was June, with maximum temperatures running three degrees above the long-term average, and a particularly sultry peak around the summer solstice. March was also around three degrees warmer than it should have been, indeed it was a mild spring overall, which is only fair following a coldish January. Around twenty days failed to reach 5°C, which is twice as many as last year, but temperatures never once remained below freezing all day (thanks to the inner London heat island effect). Minimum temperatures show a similar up and down pattern. Thirty-five days this summer had nights with temperatures exceeding 15°C, ideal for sitting outside, and the temperature pretty much never went below 10°C throughout the summer. March enjoyed more than its fair share of mild nights, relatively speaking. Meanwhile there were as many as twenty nights, mostly in January, when the temperature dropped below freezing - again anywhere outside central London will have had rather more. We're not used to seeing actual sunshine data, more usually simplifying the weather to "gosh it's sunny" or "oh it's dull". This year we've enjoyed twenty days with over twelve hours of sunshine, all of them in the middle of the year because the sun's not above the horizon long enough at other times. Meanwhile one hundred and forty days saw only one hour of sunshine or less, with over sixty days having no sunshine at all. December has been the month with the greatest number of entirely overcast days, while February was the most uncharacteristically dull month. January turns out to have been the month which most exceeded seasonal expectations, indeed all those blue skies help explain how it managed to get so cold. It doesn't rain that often in London, with two hundred and twenty days this year (the bottom row) completely dry. Even most of the wet days aren't that wet, with only forty days exceeding 5mm, and fifty days sprinkled with less than 1mm. The true downpour days have over 20mm of rain - that's pretty much relentless - and there are only three of those. February and September had the most wet days, but July turned out to be the wettest month, which may confirm your worst suspicions about the summer. Meanwhile April was by far the driest, with barely a splash in the Hampstead gauge. But rainfall is a notoriously erratic statistic, often varying wildly geographically, and one torrential outburst can outrank weeks of lighter precipitation. 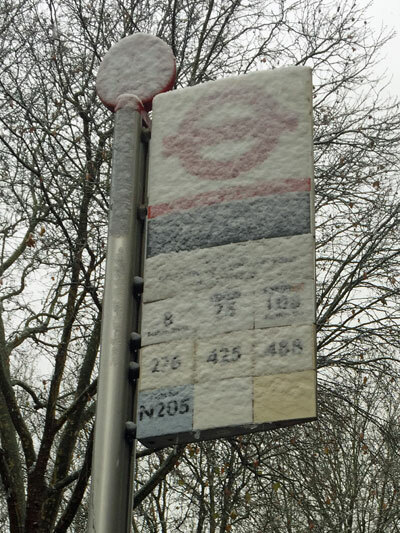 Finally, still based on observations in Hampstead, a look at some of the more unusual meteorological conditions. Fog has been infrequent this year, with much clearer skies than last. 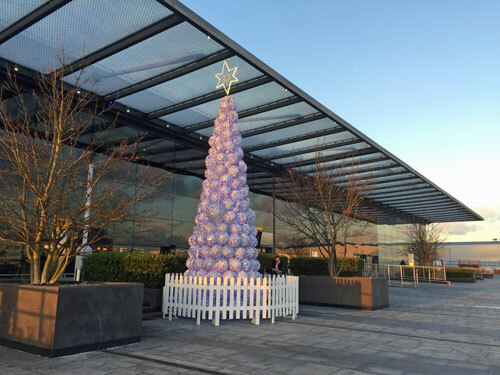 Air frost was particularly prevalent in January, but London's outdoor plants were then unaffected until the last day of November. Of the five days of snow, only one in January and one a few weeks ago amounted to any more than a flurry. It only hailed in spring, and as for thunder, 2017 has been unusually rumble-free. But overall, as you'd expect, the weather has been fairly ordinary. Here's to more typically atypical weather in 2018. At the end of last year I asked whether you had a ticked-off tube map. 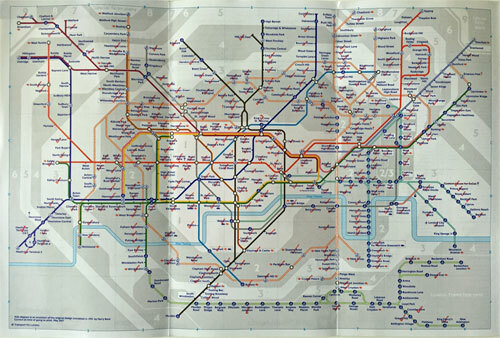 That's a tube map on which you tick off every tube station you visit. A tube map which shows all the stations you've either entered or exited. A tube map which shows the extent of your travels on the tube network. I start with a clean map on New Year's Day and update it daily. At the beginning of the year, if I've been out and about, there are often two, three, four or more stations to tick off. Later in the year the ticking off gets less frequent, but over the course of three hundred and sixty-something days it all adds up. By my calculations there are 293 red ticks on my 2017 map, each of which marks a station I've walked into or walked out of over the last year. Interchanging doesn't count, and nor does simply travelling through, otherwise in my case they'd almost all be crossed. As it is, I've swiped my Oyster at approximately two-thirds of the stations on the tube map this year, which is an impressively high percentage. My life as a serial London nomad helps to keep the map full. I've been to Heathrow, Stanmore, Chingford and New Addington for the blog, and all sorts of stations inbetween. I believe in blogging the whole of London, not just the well-known bits in the middle, which means this map looks a heck of a lot busier than it would otherwise be. But this year I've gone one step further than normal. At the start of December I noticed that I'd been to almost of the stations in zones 1, and most of the stations in zones 2 and 3. Hmm, I thought, maybe I can tick off all of them by the end of the year. I had to discount zone 3, because the Goblin is closed until 2018, and I hadn't been to five of the stations along its length. But zones 1 and 2 I could complete, I thought, and so I did. Zone 1 was easy, I only had 10 stations to left to visit, and they were relatively close together. But I hadn't counted on how tediously time-consuming zone 2 would be. There are approximately 140 zone 2 stations on the tube map, and I still had 50 to visit, and they're somewhat more spread out. For example I still had to go to Hampstead, Stamford Hill, East Putney and Deptford Bridge, each of which I'd passed during the course of the year by train and by bus, but never got out or switched between the two. The requirement to either enter or exit each station is the pain. Normally you'd take the train between adjacent stations, but having just alighted at one I needed to find some other way of getting the other... or else spend all my time double-backing through ticket gates, which I wasn't prepared to do. So I spent a lot of my time walking between stations, or taking the bus, which seriously increased the time this took. Thankfully these random journeys proved somewhat interesting, as I got to see bits of inner London I don't normally see. Enforced spells above ground introduced me to Lewisham backstreets I was unfamiliar with, opened my eyes to Frognal Lane and confirmed that all of Earl's Court has now been demolished. But all this meant mopping up my 50 missing Zone 2 stations took the best part of four days, which is perhaps not the best use of anyone's time. One thing that's helped to me tick off so many stations is my annual Travelcard. I've paid up front to travel anywhere in zones 1-3, so hopping onto a train anywhere across central London is essentially free. Pay As You Go customers ticking off Inner London stations would soon hit the £6.60 daily cap, after which subsequent z1-2 journeys would be free, but venture out to zones 5 or 6 and the cap rises to over £11, so that could be an expensive way to spend a day. As well as ticking off stations, I also keep track of all the lengths of track I've ridden on. This is an additional stage, not always easily accommodated, and only for the serial ticker-offer. But it does allow me to tot up how much of the TfL network I've ridden this year, and to compile the following list as a convenient track-bashing summary. It's not a competition. But if you got yourself a tube map and a biro this time last year, like I suggested, presumably you can now tell us how many stations you've been to. Go on then. If not, we're due a new tube map at the end of next week, so grab one, hang onto it, and mark off all the stations that you visit throughout 2018. You may need to adjust it next December when Crossrail arrives, but there won't be that many new stations to add, so I'm sure you'll cope. If you're up for a bit of a challenge, visiting every Zone 1 station over the course of next year ought to be relatively manageable. Or really, just forget I ever mentioned this and use the transport network like a normal person, because often that's challenge enough. Here's a wordsearch containing more than 50 Christmas words. It may look like six Christmas wordsearches. But really it's one Christmas wordsearch, six layers deep. Imagine layer 1 on top of 2 on top of 3 on top of 4 on top of 5 on top of 6. If it helps, click on the grid to see an arrangement where all six layers are in one long line. How many Christmas words can you find? Words run across, down or diagonally... in three dimensions. For example, the word TURKEY runs down the top left squares in each layer. And all went to be taxed, every one into his own city, using passports of the appropriate colour. And Joseph went up into Judaea, unto the city of David, which is called Bethlehem, to be taxed with Mary his espoused wife, being great with child. And it also came to pass that there went out a decree from the authorities that all the world should be especially vigilant. Saying, if you see something that doesn't look right, speak to staff. We'll sort it. And Bethlehem was packed with refugees, thanks to all the taxing, so there was no room for Joseph and Mary in the inn. And so it was that, while they were there, the days were accomplished that she should be delivered. And she brought forth her firstborn son, and wrapped him in swaddling clothes, and laid him in a manger. And the innkeeper was greatly vexed, because some unmarried immigrants had given birth in his stable in a suspicious manner. So he rang the hotline, and the authorities came round post haste to remove the entire family to a detention camp. And the shepherds were sore afraid, because a shining multitude of the heavenly host isn't what you normally see above a field, and it didn't feel right. So they rang the hotline, and the authorities came round post haste and eradicated the aerial threat before it could attack. Let us now go even unto Bethlehem, and see this thing which is come to pass, because we've all got a role to play in keeping Judaea safe. And they came with haste, and found some unattended swaddling clothes lying in a manger. And the shepherds said, one to another, this seems out of place; someone could be concealing something under that clothing. So they rang the hotline again, and the authorities put the whole of Bethlehem under lockdown, because better safe than sorry. Now when Jesus was born in Bethlehem of Judaea in the days of Herod the king, behold, there came three shady foreigners from the east. And, lo, the star, which they saw in the east, went before them, till it came and stood over where the young child had been. And when they were come unto the manger, they said, Where is he that is born a prophet of Allah? for we have seen his star and are come to worship him. And the innkeeper said, I don't believe that those are gold, frankincense and myrrh, they look like suspicious packages to me. And he rang the hotline again, and the authorities came round post haste to carry out three controlled explosions, just in case. And Herod the king heard all these things, because he was running the country and the security campaign had been his idea. And he gathered all the chief priests and scribes of the people together, and enquired of them diligently whether the existing equilibrium might be under threat. And they said unto him, every day we receive reports about suspicious behaviour or unusual activity from members of the public and we take this information seriously. And Herod was troubled by these unidentified threats, so he had no choice but to have every small child in the country slaughtered. And in this case his undue paranoia did indeed kickstart an entire religion, bringing persecution, conflict and death to millions over the subsequent millennia. See it. Shut up. Sorted. Since June TfL have been quietly chipping away at London's bus network without almost anybody noticing. Rather than cutting routes they've been reducing the frequency of the buses, affecting almost 10% of daytime routes and more than 15% of overnighters. I've been keeping track here and here. This table summarises which bus routes have had their daytime frequencies cut, month by month, and how many buses per hour they've lost. That's 48 bus routes cut, by a total of 60 buses per hour. Here's a similar table for weekend nightbuses. That's 22 nightbus routes cut, by a total of 50 buses per hour. 30% of "nightbuses beginning with N" have been cut. September was particularly savage. The N29 was the biggest casualty. One reason for the cuts is that fewer people are travelling by bus, so fare revenue is lower and it's become uneconomic to run too many buses. The outcome of the cuts is that passengers will have to wait a bit longer for each bus, so might drift off to other modes of transport, which'd mean fewer people travelling by bus. A potentially vicious circle. Meanwhile these are the 21 bus cuts TfL already have lined up for January. More cuts will be announced later, I'm sure. I'll report back as the new year progresses. I wonder when Londoners will finally notice. Thanks for all your ideas regarding a follow-up to my Herbert Dip project. Here's why I won't/can't/shan't/might have a go. Where will Crossrail take you? That hike along the Heathrow flightpath was my final Herbert Dip. If you remember, I challenged myself back in January to visit each of the London boroughs proposed by the Herbert Commission in 1960. 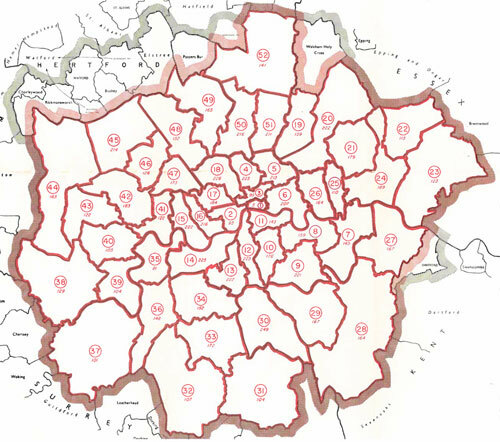 They came up with a list of 52 boroughs, including some outside what we now know as London, eventually whittled down to the 33 boroughs we know today. And I've now written a post about all 52 boroughs, at the rate of approximately one a week, ordered by the shuffling of a pack of cards. Here's the full, clickable list, confirming what a lengthy all-encompassing challenge this has been. Turning over each card was the easy bit. 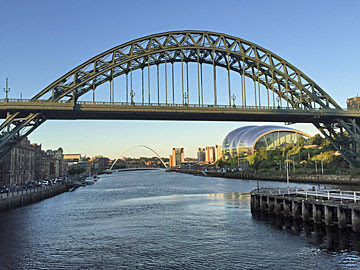 I then had to locate the former borough, think up something to do there, go out for the day to explore, and then come home and write the whole thing up. The best way to locate each former borough, I discovered, was via the Vision of Britain website. This stores all kinds of information about former administrative units, which could prove invaluable if you do historic or genealogical research. To generate an archive map, first search for a place, then choose Units and statistics from the sidebar, then select the appropriate Administrative Area from the table, then choose Boundary Map. 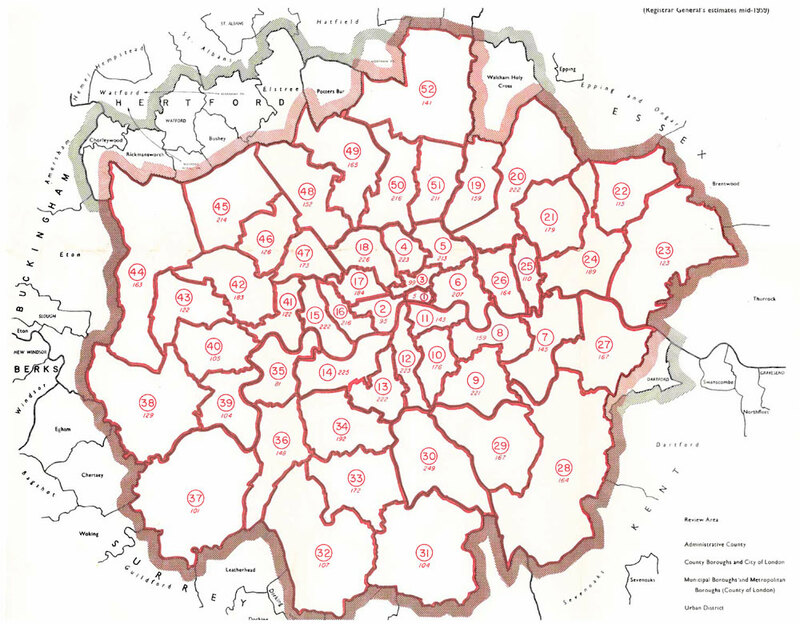 For example, here's the map for the Metropolitan Borough of Poplar, here's Penge Urban District and here's the Municipal Borough of Edmonton. Rather more problematic was coming up with an idea for what to do when I got there. After 15 years of blogging I've been to most parts of London more than once, so it wasn't always easy to find a fresh focus. But I think I managed to find a plethora of original angles, and my explorations succeeded in taking me to several places I'd somehow never been to before (hello Feltham, hello Cudham, hello Hacton). As a quick clickable checklist, here are all the ideas I came up with on my playing card journey. One thing I noticed is that writing up these 52 posts tended to take longer than normal. More words, more photos, more research, more links, more time. This didn't usually equate to more comments, but that's fine, because it's unlikely you ever lived or worked in the borough I was writing about. Another thing I noticed is how much I enjoyed doing it. What a brilliant excuse to force myself to visit a complete cross section of London and its suburbs, which it's all too easy never to do otherwise. I bet you haven't recently. Thank you playing cards, you were great. Which leaves me a week and a bit to come up with a fresh idea for 2018. Something vast but manageable, and broad but precise. It needs to involve actually going somewhere - London preferred - but nothing too rigid, so not 'pubs alphabetically', or 'pillar boxes within 100 metres of Crossrail stations'. I think one of the reasons the playing card tour worked is that it wasn't overly specific, more a frame to hang ideas from. Something inspirational will crop up, I'm sure. And if it doesn't, no big deal.